The Barnsley Youth Swing Band – takes place on a Monday night 6pm – 7pm. This band is aimed at our beginners age 6-11 years. 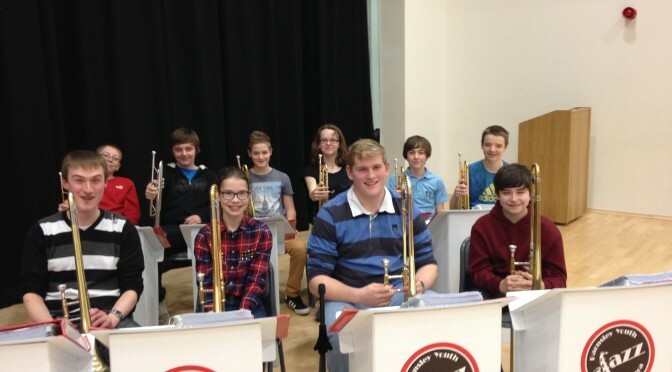 The Barnsley Youth Jazz Orchestra – takes place on a Thursday Night 6pm – 7.30pm. This Band is aimed at our Intermediate level students age 11-18 years. The Dearne Big Band – takes place on a Thursday Night 7.30pm – 9.30pm. This Band is aimed at Advanced players aged 18 and above. When your child’s teacher believes that your child has made sufficient progress all musicians will be invited and encouraged to play in one or more of our bands at no extra cost. Playing together is an important aspect of music, pupils’ progress quicker, make new friends and most importantly find learning fun. We regularly hold concerts at local venues to give children the opportunity to perform on a regular basis.